The bath basics: tub, shower, toilet, sink, cabinet. The elemental bath is just a place to perform your daily duties, but it’s the details that will take you beyond the essentials. 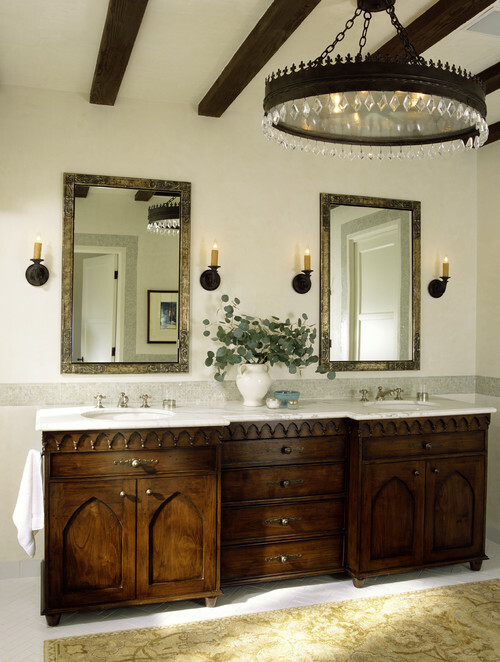 It’s the details that will transform a plain bathroom into a true retreat, an oasis that can invoke relaxation and rejuvenation of body and spirit. The transforming details of a luxury bath can be found everywhere–from the little things, such as pretty knobs and towel bars, to the big things, like sumptuous spa tubs and showers. While careful space planning is a must for any bathroom renovation, thoughtfully chosen and finely crafted details are the defining elements of a bathroom that will create a space defined by luxurious comfort. Here’s a look at some divine details to inspire your design dreams. Gothic arches in the door panels, crown trim on cabinetry, a pair of castle-like scones and chandelier, plus wood beams on the ceiling are intriguing details that work in concert to create a modern twist on the gothic revival style of the late 19th century. Photo by Tommy Chambers Interiors, Inc.
With white as the main element, and black as the second, this beautiful, yet simple, gold hardware really makes a statement. It works because it fits in perfectly with the industrial-style bathroom, and proves you can even make a feature of pipework that’s normally considered unsightly. 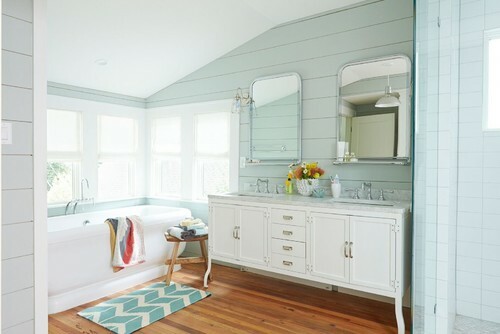 Shiplap walls, curved vanity legs, hardwood floors, and retro faucets complement the coastal hue to recreate the look and feel of an authentic vintage beach cottage. 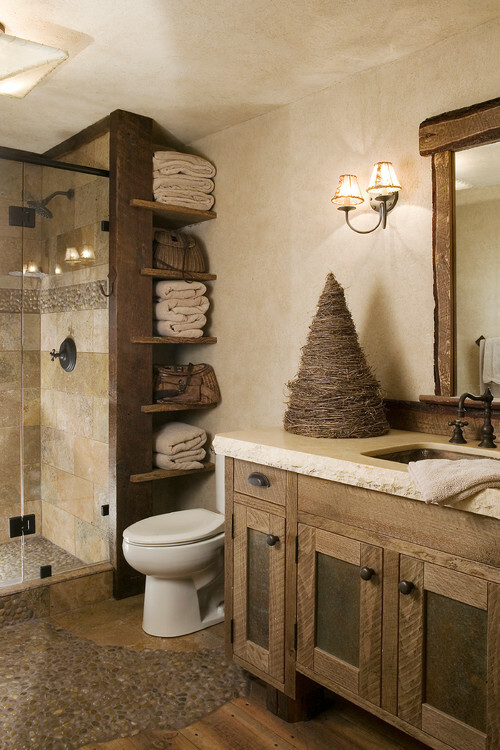 Pebble floors and rustic wood details combine to create a rich, organic “mountain style” bath retreat. 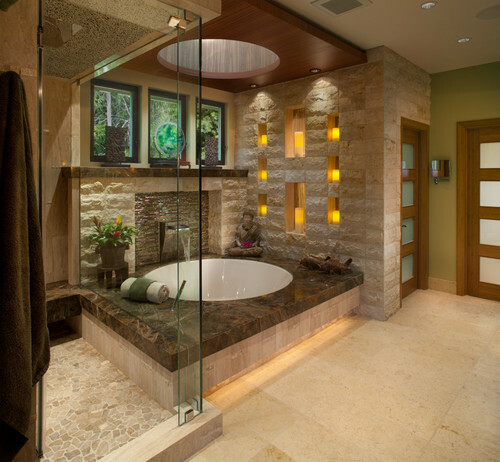 Design details abound in this Asian style zen paradise that also includes programmable mood lighting, automatic LED candles, heated floors and towel racks, and chromotherapy in the tub and shower. 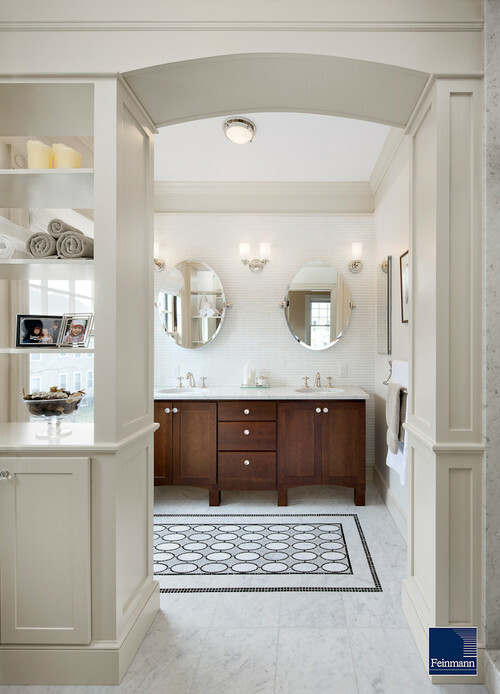 The tile “rug” in this handsome Victorian bathroom makes a significant design statement. 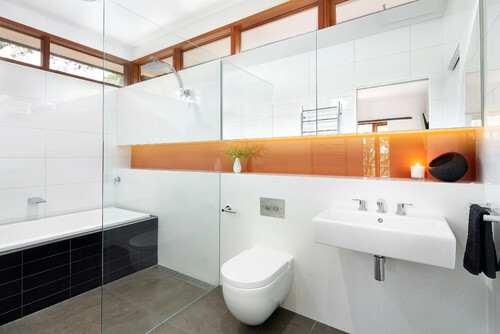 Though minimalist in style, this bathroom has all the right details, including an eye-catching orange custom painted glass splashback. At Prestige Marble & Granite, we understand that it’s the details that can make the difference in basic design and extraordinary design. Stop by our Columbia, Tennessee showroom and let us show you the possibilities!